Despite this, cut grading based on table and depth reigned supreme. Terms such as “60/60” (denoting a 60% table and 60% depth) were touted in some areas of the world as the pinnacle of diamond cutting. Whilst most grading labs, including the GIA only listed the table and depth, this system was flawed, as no crown or pavilion angles were given, not to mention minor facet information. This was akin to the first generation “brick” mobile phones. 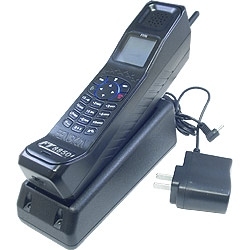 Above: A brick mobile phone as seen in the 1980s. 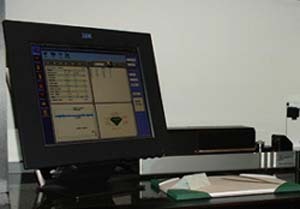 In the 1990s, Sarin machines were popularised throughout the diamond trade. This allowed basic proportion information, such as crown and pavilion angles to be given to retailers and consumers. Whilst a major improvement, adopted by the then newly formed and “cut-focused” AGS laboratory, this method still lacked important information on minor facets. Above: A typial Sarin machine setup. In 2006, GIA introduced their own gut grading system for round brilliant diamonds. Whilst criticised by some in the trade for being too lenient toward deeper stones, it did introduce some important minor facet information on the certificate. Apart from the usual crown and pavilion angles, it also gave information on lower girdle facets and star facets. This is what I call “two and a half generation” cut grading, as it has most of the information needed to visualise what a diamond will look like, without giving the full picture. Above: Proportions listed on the GIA report. The star and lower girdle ratios are on the left hand side. Whilst these tools are still only being using by a very small proportion of the trade, they all aim to give a complete picture of a diamond and it’s cut grade. Moreover, these tools can be used to grade not only round brilliant diamonds, but also any other shape that exists and may be invented in the future. As you can see, just like the rest of the technology world, diamond cut grading has evolved greatly over the years. However, it remains to be seen whether or not the latest technology will be widely adopted, or traditional retail sales techniques will prevail. This entry was written by Nikhil Jogia and was posted on on Thursday, December 2nd, 2010 at 7:59 am	and is filed under Diamonds. You can follow any responses to this entry through the RSS 2.0 feed. You can leave a response, or trackback from your own site.